I think I am finally beginning to get the hang of working on an Independent Project. It has taken me a while to adjust my pacing and work ethic, but slowly and surely I am getting there. 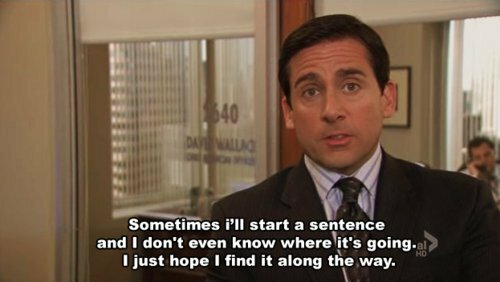 Sometimes my project feels a little like what Michael Scott from The Office was describing in the picture below, but everyday I am getting more and more involved in my project and my goals are becoming cle arer. This entry was posted in History and Current Issues, Visual and Performing Arts and tagged blogging, History, independent study, Syrian Refugee Crisis, westtown school, writers on February 15, 2016 by emmalefebvre.